Unlike many other ethnic cuisines, Mediterranean cuisine is not the product of a specific ethnic group or culture. Rather, it is a label referring to the culinary trends shared by a diverse array of peoples that live in the region around the Mediterranean Sea. While Mediterranean cuisine is understood to be a unified culinary tradition in this country, in reality, there is a vast amount of cultural variance in the cooking found in this geographic region. Although Mediterranean cuisine isn’t governed by a single culture, it is very much the product of cultural influence and exchange. The world’s earliest civilizations bordered the Mediterranean Sea, their development bolstered by the rich soil and temperate climate that made agricultural production thrive. As the point of intersection between Asia, Europe, and Africa, with major civilizations located in each area, the Mediterranean was geographically destined to become a major trading hub. Traders exchanged cultural commodities like spices and other food goods, resulting in the wide dissemination of certain ingredients throughout the cuisines of these disparate peoples. It was through this form of cultural interaction that certain fundamental elements of Mediterranean cuisine became popular throughout the region. Conquest was another factor in shaping Mediterranean cuisines. The different cultures of the Mediterranean came into direct contact as a result of the empire-building efforts of various civilizations. Once one civilization overthrew the government of another, they often imposed their own cultural practices upon the conquered society. At the same time, there was inevitably a certain amount of cultural persistence during conquest, often resulting in the amalgamation of the conquering group’s culture with that of the conquered. As societies blended together within the empire, culinary practices were adapted and conformed, resulting eventually in the adoption of the current culinary identifiers of the Mediterranean cuisine by people throughout the region. The overarching characteristics of Mediterranean cuisine are largely shaped by the climate and geography of the region. The sunny, mild Mediterranean climate yields an agricultural bounty that heavily influences the vegetable-dominant cuisines of the region. The most universally used and prevalent ingredient in the cuisines of the Mediterranean is olive oil. Olive trees are prevalent throughout the region, and the distinctive oil is a major export of many Mediterranean countries. The pungent, sometimes bitter oil works its way into a variety of dishes, and is used both as a cooking agent and a dressing. Olives themselves are a regular ingredient in Mediterranean cuisine, adding a punchy, fermented, acidity to dishes. 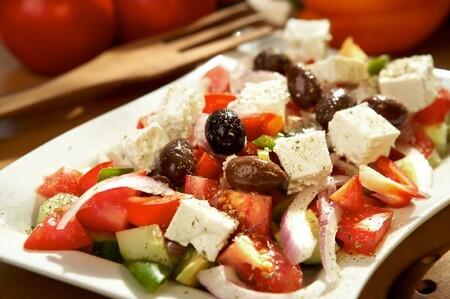 Fresh vegetables dominate Mediterranean cuisine, with a wide variety taking center stage in dishes throughout the region. While there is some cultural variation, eggplant, artichokes, squash, tomatoes, legumes, onions, mushrooms, okra, cucumbers, and a variety of greens and lettuces all flourish in this region and are commonly used. Vegetables appear in dishes in a variety of forms: baked, roasted, sautéed grilled, puréed, and served fresh in salads. Meat is generally used sparingly in Mediterranean cuisine, and, in most of the Mediterranean, tends to be grilled. The Mediterranean’s rocky terrain can’t typically support larger herding animals like cows, limiting meat options to smaller domesticates like goats, sheep, pigs, and chicken, as well as some wild game. Goat and sheep milk are also used in a variety of Mediterranean dishes, primarily in the forms of yogurt and cheese. Seafood is a more prevalently used protein source, appearing in variety of dishes. The close proximity to the Mediterranean Sea provides easy access to fresh seafood, which makes frequent appearances in dishes throughout the region. A preponderant use of fresh herbs characterizes Mediterranean cuisine. The climate and geography of the region is naturally suited to growing herbaceous plants, both indigenous and imported. While there is some cultural variation in the use of certain herbs, overall the culinary traditions of the Mediterranean use basil, oregano, thyme, rosemary, marjoram, parsley, dill, mint, garlic, tarragon, fennel, cilantro, and saffron. Although there are common elements that unify the cuisines of the Mediterranean, there are some significant regional and cultural differences. The Mediterranean can be divided into three culinary regions: Eastern Mediterranean, Southern Europe, and North Africa. Eastern Mediterranean cuisine, which encompasses some Middle Eastern cuisine, describes the culinary traditions of Greece, Turkey, Syria, Lebanon, Israel, Palestine, and Egypt. Yogurt and fresh cheeses like feta, halumi, and lebanah feature prominently in Eastern Mediterranean cuisine: yogurt appears in a variety of sauces or as a condiment, while cheese can be either cooked into dishes or eaten raw in a multitude of culinary contexts. The flavors of parsley, sumac, mint, and lemon juice dominate the Eastern Mediterranean cooking palate, while pomegranates and nuts are regular ingredients in sauces and spreads. Grains take the form of rice or flat breads like pita and lavash. Lamb, mutton, poultry, and goat meat are prominent proteins, and are typically grilled—either whole, as skewered chunks of meat like kebabs, or ground and skewered like kibbeh—or spit-fired like gyros. Bulgar wheat is also used, predominantly in salads like tabouleh. Chickpeas are used in a variety of contexts, often as a meat substitute, and can be cooked whole, ground into a paste for a spread, or fried. Southern European cuisine, which is found in Italy, Southern France, and Spain, contains specific ingredients that distinguish it from the rest of Europe’s cooking traditions and other Mediterranean countries. Unlike other Mediterranean cuisines, wine is a prominent element of Southern European dining, both as a flavor enhancement in cooked dishes and on its own. Pork is also consumed more by these countries than the rest of the Mediterranean, and is more prevalent than goat, mutton, or lamb. Tomatoes, garlic, capers, anchovies, mustard, anise, and pine nuts are used in a variety of combinations to flavor Southern European dishes. A multitude of different grains are consumed: leavened breads, pasta, and rice are staples. North African cuisine is characterized by an abundant use of spices. Morocco, Algeria, Tunisia, and Libya all regularly use cumin, coriander, saffron, cinnamon, cloves, chilies, saffron, and paprika in their cooking traditions. Harissa and ras el hanout are two fiery spice mixtures used predominantly in Moroccan cuisine, giving a characteristic heat to stews and sauces. Dried fruit like dates, apricots, and raisins make frequent appearances in North African cuisine, both on their own and in cooked dishes. Preserved lemons add a characteristic salty, brined pungency to North African food. Couscous, granular semolina that has the appearance of bulgur wheat with a rice-like texture, is a popular North African grain, accompanying a variety of stews and meat dishes. Lamb, mutton, and goat meat are the dominant protein in North African dishes, although chicken, and even beef, make regular culinary appearances. The Moroccan tagine, a slow-cooked stew of meat, vegetables, and sauce prepared in a conical-shaped ceramic pot, is perhaps the most recognizable and popularized of North African dishes: an aromatic, hearty, well-balanced dish.